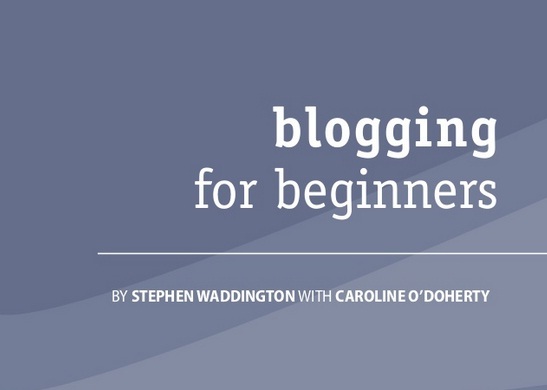 Caroline O’Doherty and I have collated our blog posts about blogging published over recent months into an ebook that we’re publishing today. It’s a guide to blogging for anyone wondering how to get started. The ebook follows the process of launching a blog from a blank sheet of paper to building and managing your own space on the Internet. It’s exactly how our project developed. I published an ebook called The Business of Blogging at the start of 2014 to celebrate the 20th anniversary of the blog. More than 10,000 people have viewed the book in six months. It was a crowdsourced exercise and featured stories from bloggers about their personal blogging experiences. Richard Bailey, Heather Baker, Stuart Bruce, Judy Gombita, Andrew Grill, Neville Hobson, Chris Lake, Rachel Miller, Mat Morrison, Lee Odden, Dan Slee, Heather Yaxley, and Philip Young, all contributed to the project. Caroline contacted me asking for advice on sources of information to help her kickstart her efforts. She’s a campaign manager and freelance marketing professional based in the north east of England. There are many excellent resources in print and on the Internet but I thought it might make a good series of blog posts for us to work together and report on progress. Caroline agreed and over the course of six months we discussed and debated the challenges and benefits of a blog. We specified, designed, built and launched a blog called Northern Ideas. My thanks to Margaret Clow who helped edit the blog posts into a book format and Claire Hall who added a case study about her own personal experience of creating and running a blog. I hope that you find our content useful and that it inspires you to think about launching your own blog. We’re distributing the eBook freely under a Creative Commons 3.0 licence but if you find it useful I’d be grateful for a donation to Macmillan Cancer via our family JustGiving page. It’s personal. My wife is recovering from breast cancer and we’re hugely appreciative, as a family, for the support we’ve had from Macmillan throughout the process of diagnosis, treatment and now recuperation.